Asian shares were mostly higher Friday after an overnight rally in U.S. markets helped by the European Central Bank’s decision to extend its bond-buying economic stimulus program. South Korea’s benchmark slipped as lawmakers began voting on whether or not to impeach President Park Geun-hye. 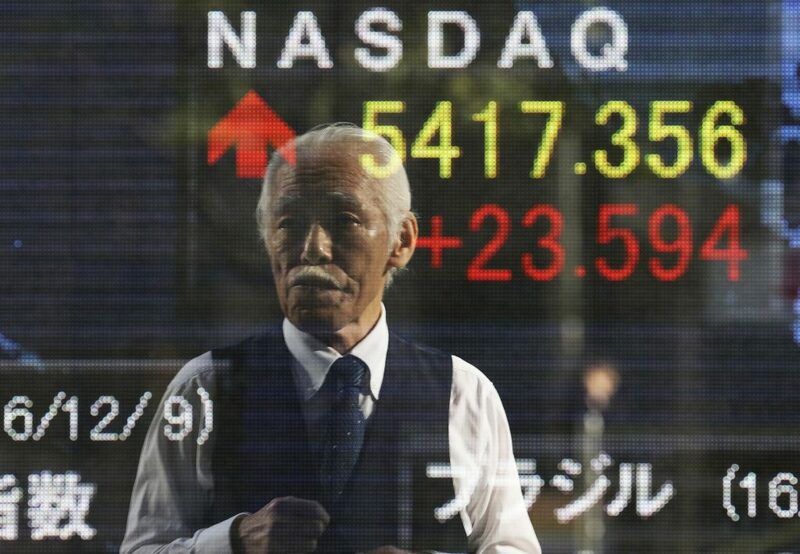 Japan’s Nikkei 225 gained 1.2 percent to 18,996.37 as the yen weakened against the dollar. The Shanghai Composite Index rose 0.5 percent to 3,231.46. Australia’s S&P/ASX 200 advanced 0.3 percent to 5,560.60. Indexes in most Southeast Asian countries also rose but Hong Kong’s Hang Seng index fell 0.5 percent to 22,749.74. The European Central on Thursday extended its bond-buying economic stimulus program, known as “quantitative easing,” as investors expected. It will spend about $579 billion through the end of 2017. But starting in March it will begin spending less on bonds. The move is seen as a hedge against political uncertainties such as Italy’s recent referendum and elections next year in France, Germany and the Netherlands. China’s slowdown, U.S. rate hikes and the impact of President-elect Donald Trump on growth and global trade also loom large. “The ECB’s policy change looks like a typical compromise where the hawks have been prepared to concede an extension of the minimum time frame for QE in return for a taper. The bottom line for markets is that QE will continue at a substantial rate for another 12 months with the possibility of being increased if conditions deteriorate,” CMC’s chief market strategist, Ric Spooner, said in a commentary. Reports that China has slashed the amount of cash that can be withdrawn from Union Pay-linked ATMs in the gambling enclave of Macau cast a shadow over Hong Kong’s bourse. Beijing has been cracking down on corruption and is concerned over outflows of capital as the Chinese currency weakens against the dollar. The Fed is expected to raise its key interest rate by 0.25 percent at its policy-setting meeting next week, a year after its last rate hike. Investors are watching for clues about whether the Fed will stick to “gradual rate hikes” and how significant fiscal stimulus will be under Donald Trump. U.S. data remains solid, with non-manufacturing business-conditions index rising, job openings and hiring remaining strong and jobless claims low. U.S. markets again set all-time highs on Thursday. The Dow Jones industrial average climbed 0.3 percent to 19,614.81. Standard & Poor’s 500 index picked up 0.2 percent to 2,246.19. The Nasdaq composite had lagged behind the other major indexes over the last two weeks, but it rebounded to rise 0.4 percent, to 5,417.36. The Russell 2000 index of small-company stocks jumped 1.6 percent, to 1,386.37. Benchmark U.S. crude oil rose 33 cents to $51.17 per barrel in electronic trading on the New York Mercantile Exchange. The contract gained $1.07, or 2.1 percent, to close at $50.84 a barrel in the previous session. Brent crude, the international standard, gained 19 cents to $54.08 a barrel in London. It rose 89 cents to $53.89 a barrel on Thursday. The dollar rose to 114.42 yen from 114.20 yen. The euro was flat at $1.0603.